It was my 3-day weekend and I laid around for most part of the day until I went and got my license plate for black beauty(my car), but the highlight was not hearing my alarm go off at 5a. Lately, these days I am all over the social media outlets…FB, Instagram (_itsbobbiesworld) and Twitter (itsbobbiesworld) are you following me? This past weekend Atlanta hosted the Blogalicious5 blogger event and I followed some fabulous people who were doing live recaps of the event since I was unable to attend. But following them made it seem like I was there. 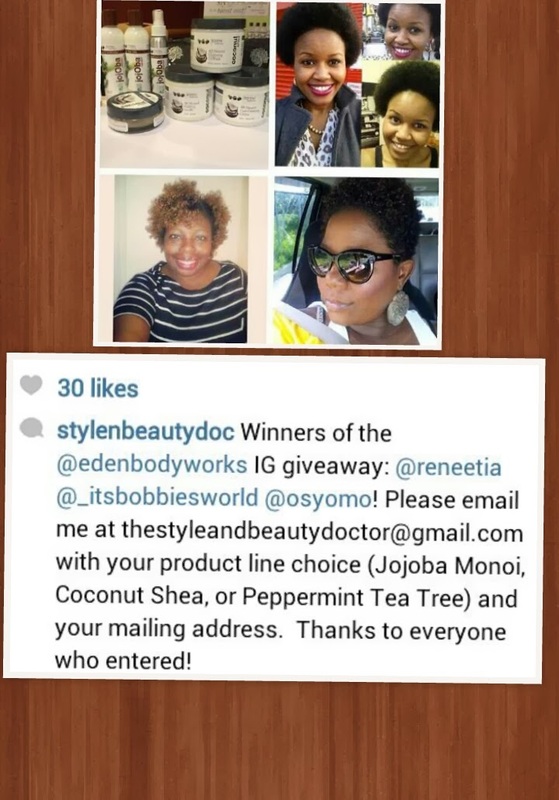 One person I was following was Danielle Gray of www.thestyleandbeautydoctor.com she and EdenBodyWorks along with #Bagladieslive were doing a giveaway and I entered. I hardly ever enter these contest because I’m always thinking me winning will be slim to none, but I entered anyway and guess who won??? ME!!!! I was so shocked. 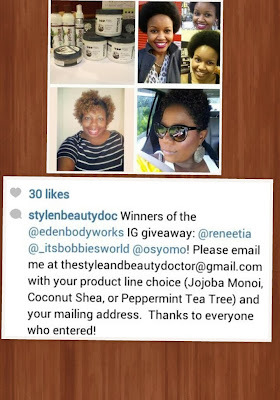 I will receive 5 full size products of EdenBodyWorks hair products. Brooklyn (my hair) and I will be looking forward to using these products. Saturday, I attended my co-worker hubby birthday dinner at her house. Sunday I attended my girl Sophia birthday celebration/Spa party and met some fabulous ladies. Her celebration was so fitting to her, she is so fabulous. But before I headed to the birthday celebration, I gave a donation to the Roddy White (Atlanta Falcons WR) foundation. 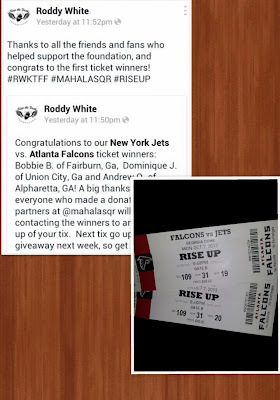 The donation was $1 and that will enter you for a drawing to attend the Monday Night Football game at the Georgia Dome as the Atlanta Falcons will host the New York Jets. I donated a few dollars and that was it…even if I didn’t win, it was for a good cause and I gave because I was able to. I went along with my day, and wouldn’t you know later that night about 11:30p I received an email saying….I was one of the ticket winners!!! In ending this….and I think the best highlight of my weekend was receiving 3 unexpected checks Saturday in my mail box, they were not very much at all, but it was better than receiving 3 bills that said “NOW DUE,” lol. Now, do you see why I say I was “literally winning” this weekend? Enough about me…how was your weekend? Oh wow Bobbie that is awesome! Congrats on all of that! You were a busy woman This weekend I see. That's good!